It’s not often that politicians from different parties see eye-to-eye on an issue, but expansion of pre-k is an issue that crosses party lines and unites Republicans, like former Governor Mark Schweiker, and Democrats, like former Governor Ed Rendell. High-quality pre-kindergarten and childcare programs close the opportunity gap, reducing the need for special education and remedial instruction. 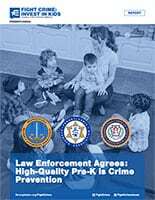 In addition, all the data show that access to high-quality early learning decreases crime, incarceration, and dropout rates during teenage years. This interactive review at the Pennsylvania House, Senate and school district levels includes local data on children served, unmet need, the number of high-quality providers, current capacity and much more. Not sure where your legislative districts or school district are on the maps? No problem. Use the convenient search functionality on each map to look up your legislators or school district. To learn more about the state of pre-k in your county, click on an individual county in the map below. 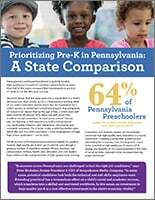 Click on the STATEWIDE tab above to download a summary of pre-k in Pennsylvania. 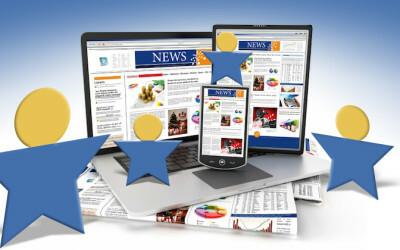 Citations for the data are listed under the NOTES tab. To learn more about how pre-k will benefit economic development in your region, click on the BUSINESS CASE for Pre-K tab. What’s the state of pre-k in your county? Click on the map below to download the most current statewide summary of pre-k in Pennsylvania. 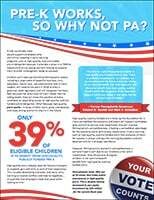 Each fact sheet includes data points from “School Readiness Report: Pennsylvania’s Youngest Learners Have Waited Long Enough” county-level data tables found at http://www.papartnerships.org/publication_files/school-readiness-data-sheets-feb-2015.pdf. High-quality pre-k includes: an unduplicated count of PA Pre-K Counts, Head Start Supplemental Assistance Program, and Keystone STARS 3 and 4 enrollments; Head Start; public school pre-k; accredited or PDE licensed nursery school; and providers accredited by the National Association for the Education of Young Children, National Association for Family Child Care, National Early Childhood Program Accreditation, and Council On Accreditation. Publicly funded, high-quality pre-k includes: the unduplicated count of PA Pre-K Counts, Head Start Supplemental Assistance Program and Child Care Works enrollments in Keystone STARS 3 and 4; Head Start; and public school pre-k.
One of the keys to sustained economic growth in Pennsylvania is to generate additional sales of local goods and services, while also creating new jobs. 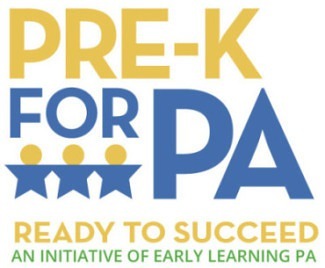 That is why the Pre-K for PA campaign asked researchers from ReadyNation to model the impact of significant expansion of Pennsylvania’s high-quality pre-k system and its potential impact on the economy of the state and its major economic regions. These reports document that investments in early learning provide a significant, immediate economic boost for local businesses and help build stronger communities over the long term. 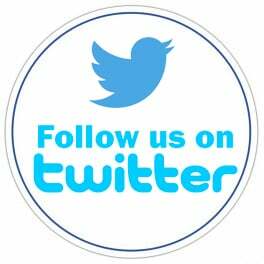 Click below for regional data on the business case for pre-k.
Click here to view all the most recent pre-k news. We hired a bi-partisan polling team to conduct two polls among PA voters in the fall of 2013 and 2014. The results? 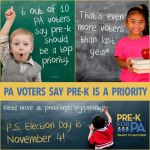 There is strong voter support to ensure all children can access high-quality pre-k. Click below to see both years’ polling results.